E-Trade is a financial advisement, investment and trading company that’s been around for over 30 years. Brokerage accounts, retirement accounts and small business accounts are some of its offerings. In 2017, the company reported 172,000 net new brokerage accounts with assets totaling $12.2 billion. E-Trade Core Portfolios, formerly known as E-Trade Adaptive Portfolio, is E-Trade's robo-advisor offering. If you’re not familiar with robo-advisors, they are online-only financial advisors that are usually cheaper than traditional financial advisors. Core Portfolios is an algorithm-based investment account that is set up based on customers’ answers to an investor profile questionnaire. The questionnaire comprises eight questions that revolve around investment objectives, financial goals, liquidity needs, time frames and risk tolerance. Once customers complete the questionnaire, the algorithm will present a tailor-made investment proposal. As the client, you'll make the final decision as to whether you approve of the proposal. You can pick between a portfolio of all exchange-traded funds (ETFs) or a combination of ETFs and mutual funds. Once you've settled on a plan, E-Trade then begins investing your money into the chosen ETFs or mutual funds within the next three business days. You can update your questionnaire at any time if your needs, goals or time frame change and you'll be provided with a new portfolio recommendation. The following accounts are available with E-Trade Core Portfolios: individual accounts, joint accounts, custodial accounts, traditional IRAs, Roth IRAs, rollover IRAs, beneficiary IRAs, IRAs for minors and Roth IRAs for minors. Pricing: How Much Does E-Trade Core Portfolios Cost? The base advisory fee for E-Trade Core Portfolios is 0.30% of your total account balance. This annual fee will be charged based on the average daily balance for the account during each quarter. That total will be deducted from the account’s balance at the beginning of each new quarter. The minimum balance required to open an E-Trade Core Portfolios account is $5,000. Though the advisory fee is supposed to consume most or all of what you’ll pay for your account, there will be charges assessed for the trading of ETFs and mutual funds. E-Trade states in its terms documents that it will look for trade options that feature low underlying fees. There are no performance fees. E-Trade utilizes what it calls a wrap fee program. This means that the advisory fee will be taken directly from your account on schedule. In most cases, this fee will be pulled from a 4% cash excess held in your account. If there are insufficient funds for this, the remaining amount will be picked up by E-Trade’s liquidating sufficient securities service. This can have a significantly negative effect on the account’s performance. E-Trade bases its investment strategy on modern portfolio theory. This investing strategy is used by the majority of robo-advisors. Modern portfolio theory advocates investing in a diversified portfolio, across different types of investments. The theory says that risk is an inherent part of high reward but by having a diversified portfolio, an investor can capture higher potential rewards at a lower risk level. On top of the use of this theory, E-Trade selects your particular investments by using and analyzing data points for each ETF -- expenses, liquidity, historical performance and tracking error. These are also constantly monitored and reviewed to make sure that the account’s investments are optimized. Your portfolio will either comprise of all ETFs or a mix of ETFs and mutual funds, depending on what you've chosen. E-Trade Core Portfolios combines the benefits of an algorithm-based system, with a human touch when necessary. It will automatically rebalance your funds semi-annually, or twice a year, as well as when any withdrawals or deposits are made from the account. This rebalancing will retain your original target asset allocation for how your money should be invested. Investors’ goals are constantly changing, so E-Trade offers customers the ability to view and change their investor profiles online whenever they want to. Investors will receive confirmation statements when trades have been made with their accounts, keeping them as up-to-date as possible. These features are supported by the fact the investors can also check where their money is currently invested online from either their computer, phone or tablet. 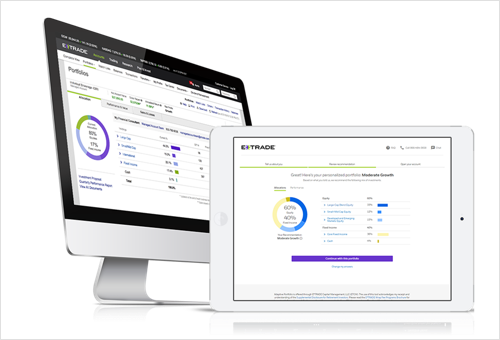 E-Trade will also send monthly trade market insights to clients. Additionally Core Portfolios offers customers the ability to set up recurring deposits. This may appeal to investors with a “set it and forget it” mentality. For investors who prefer a human touch, it’s possible to speak to E-Trade’s investment advisor representatives by calling 1-888-484-3658. These reps will help with any logistical or service-related questions. E-Trade casts a fairly wide net over prospective clients. The list of account types fit many different levels of investor. The only real stipulation for becoming an account holder is that you must have at least $5,000 to invest. That said, current E-Trade clients are a natural fit for this robo-advisor. Those new to investing who are looking for a robo-advisor that allows them to be hands-off with their investments should also consider Core Portfolios. As with most robo-advisors, prospective clients should feel comfortable with the fact that there will be almost no human advisement with these accounts. 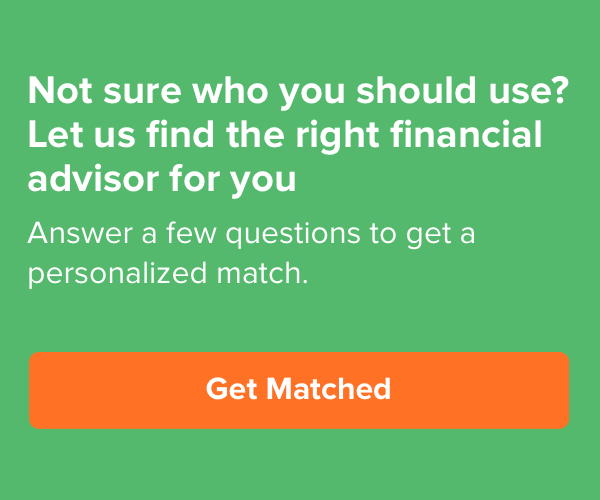 It’s worth noting that there are investment advisor representatives available to help with logistical issues associated with a robo-advisor account. E-Trade begins by giving you a questionnaire that will indicate what your goals are with your investments, when you’d like to achieve those goals, as well as how much risk you’re comfortable with when it comes to choosing what to invest in. The questionnaire is multiple choice and some of the questions include "What best describes your investing goal?," "How much risk are you willing to take to try and beat inflation?" and "How do you feel about your portfolio value rising and falling if it could mean higher returns in the long run?" Each question is accompanied by a short note that explains the question in more detail and also explains why it was included on the survey. This is an addition that new investors in particular may find helpful. Once that’s complete, a custom portfolio allocation will be created for you based on your answers. Clients can then choose whether or not they want to move ahead with E-Trade’s portfolio recommendation, depending on if they feel it’s in line with their ultimate investment goals. If these goals change down the road, clients will have a chance to take the questionnaire again or choose a different portfolio setup. At this point, you will need to choose what kind of account you want to either convert or enroll in (an individual, joint or custodial account or a traditional, Roth or rollover IRA). Following that, your funds will be implemented into your portfolio plan, with every investment being made within three business days. E-Trade will send you confirmation statements whenever trades are made on your behalf. You can also keep up online with your account standing and current ETF holdings. You’ll receive monthly market commentaries to help you stay in the loop with the latest goings-on in the investment world. Your account will be rebalanced twice a year automatically, as well as when withdrawals or deposits are made, or if the account falls drastically out of its target investment ratios. The $5,000 minimum requirement to join Core Portfolios could be a deterrent for those who are new to investing or unsure of robo-advisors as a whole. However E-Trade says that anything below that minimum makes it too difficult to create a well-diversified portfolio. Plus, it's not a catch per se, but anyone who is considering utilizing a robo-advisor should be comfortable with the fact that there's very little human involvement with your account. Competition: How E-Trade Core Portfolios Stacks Up? While E-Trade is a good choice for some newbie investors who will likely appreciate the simple process to create a custom portfolio, the $5,000 minimum balance may be a deterrent. Wealthfront, in comparison, requires just $500 to start investing. That lower entry point may be more attractive to many who are new to investing. Furthermore, E-Trade charges a 0.3% flat management fee. While that fee is in line with many other robo-advisors, Wealthfront's is slightly lower at a flat 0.25%. This makes Wealthfront a solid option for those with smaller sums to invest. Fidelity Go is a natural comparison to E-Trade Core Portfolios. Both robo-advisors will likely attract similar potential clients (those new to investing and those looking for a hands-off investing experience) and they support similar accounts. They are tied when it comes to the required minimum ($5,000) but Fidelity's management fee is slightly higher at 0.35% fee. As a result E-Trade might come out ahead for investors who can't decide between the two. Bottom Line: Should You Use E-Trade Core Portfolios? E-Trade Core Portfolios is a solid option for potential investors. It offers a wide variety of account types which should appeal to a range of customers. The 0.3% annual advisory fee is comparable with many other robo-advisors, though you can find lower rates out there. On the plus side, the fee is a flat rate regardless of how much you have invested. Some robo-advisors have fees that increase as your account balance increases. This is not a concern with E-Trade. The $5,000 minimum to start investing is a strike against it. It's on the higher side for a robo-advisor and may turn off some first-time investors who would prefer to start on a smaller scale.